As the Renaissance of digital media companies continues, how do the keepers of the brand maintain its core identity while expanding and growing, both editorially and from a business perspective? 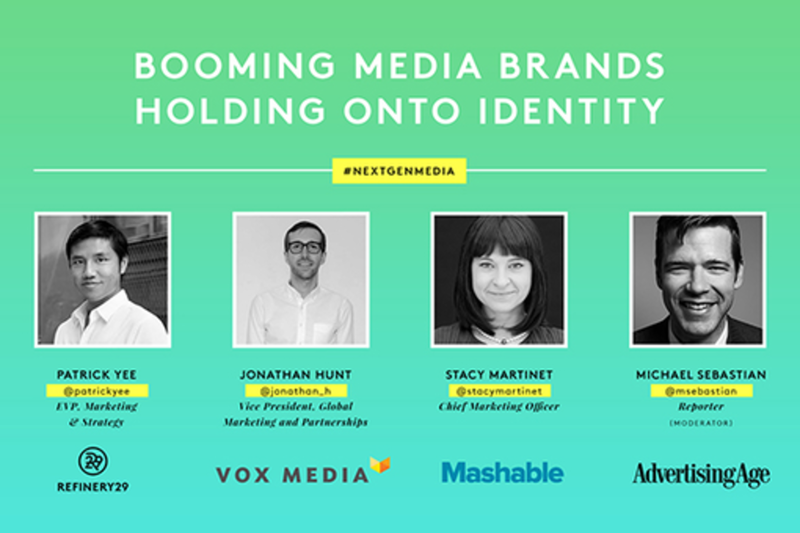 Join Mashable CMO, Stacy Martinet, Refinery29 EVP Marketing & Strategy, Patrick Yee, Global VP of Marketing at Vox, Jonathan Hunt, in a conversation with AdAge's Michael Sebastian as they break down how to maintain and monetize an evolving brand. Jonathan Hunt is the Global VP of Marketing at Vox Media where he leads audience development and distribution, co-sales partnerships, paid media strategy, and comms. Prior to joining Vox, Jonathan spent 6 years at VICE Media as their Global Marketing Director. Patrick is the EVP of Marketing and Strategy at Refinery29. Prior to Refinery29, Patrick was Founder and President of Shopflick, a venture-capital backed shopping site sold to Sugar Publishing in 2009. Before Shopflick, he co-founded RocketXL, a digital marketing agency, which was sold in 2008 to Cossette Communications Group. Mr. Yee was an equity research analyst at Soros Fund Management and began his career in mergers acquisitions banking at Wasserstein Perella. Mr. Yee graduated from New York University and is a member of the Creative Advisory Council of Nest and a Board Member of Apex for Youth.